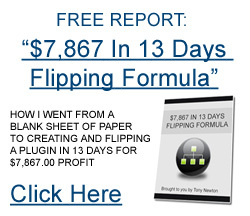 Around a year or so ago there was a huge influx on Flippa with people trying to sell custom blogs. People would just install one of the Revolution themes, add some content and then try and sell them for $197. With so many people doing it, it soon started to die off and only the blogs getting traffic or ones that were customized even further would sell. But hanging around on Flippa as often as I do, I’ve noticed that there is still a good supply of these types of blogs still selling even today. http://www.greatwaystoloseweight.com/ – This site has just sold on Flippa today for $297. It was created on the 5th March 09 and getting around 150 visitors per month. Rather than being an auto blog, it has 20 unique articles and a reasonable looking free WordPress theme. Here’s the auction. So why would it sell for such a high price? Well, the first thing would be the niche. Weight loss/fat loss/diet blogs will usually sell for a higher price than other niches. That’s because it’s an evergreen niche that is easy to monetize with Adsense, Clickbank products and CPA ads. The other reason could be the age of the blog. Being 12 months old would give it more power in the search engines when adding new content or linking to other sites that the buyer owns. It would be considered more of an “authority” than a brand new blog. Even brand new blogs can fetch the same price. http://topflyfishingsite.com/ – Another blog sold today on Flippa for $297 and it’s brand new. It’s been loaded with 30 articles but doesn’t even state they are unique. It does however have quite a nice looking WordPress theme. Here’s the auction. –	Put in a little extra work into your blogs and it makes all the difference. –	Use a nice looking theme and try and make them look unique. It is a really good post. I like it (maybe because as you I like to do site flipping as well…:o)).